Young forest is an important habitat for woodcock and many other wild animals. It’s also ephemeral: It lasts for a relatively short time span, often less than 20 years. Conservationists, habitat managers, and landowners must all work together to keep making and renewing this type of cover for wildlife now and in the future. Support habitat projects on public and private lands – projects that often yield jobs, revenue, and sustainable, locally produced timber products along with enhanced opportunities for birdwatching, hunting, and viewing wildlife. 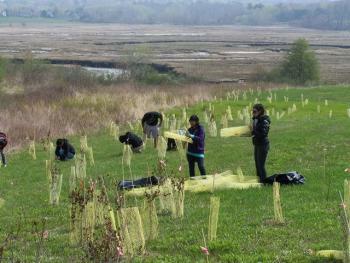 Become a well-informed advocate for the many species of wildlife that use young forest by regularly visiting this website as well as www.youngforest.org and www.newenglandcottontail.org. Check out some prime habitat. Visit a habitat demonstration site at a wildlife management area, federal refuge, timber company, or land trust property in your state: see what young forest looks like and enjoy viewing the wildlife that thrive in such areas. If you own land, create some young forest and shrub thickets. Allow an old field to fill in with shrubs. Harvest timber in a wooded area and let it grow back naturally (consider using the 5-5-5 Technique when planning which areas of your woods should be in a young growth stage). Depending on where they're located, even small habitat patches can be valuable to both rare and common wildlife. Maintain shrub fields by cutting out invading trees and mowing or brush-hogging shrubs every five to 15 years so they'll grow back as healthy dense habitat. Without natural disturbances or management by humans, most shrubland will gradually become forest, losing the low vegetation that offers the best food and cover to wildlife. Volunteer for your town select board or conservation commission, or join a land trust, and propose and support habitat projects on municipal or land-trust holdings. Wise planning is important. For a non-technical guide to making young forest habitat, consult the Young Forest Guide published by the Wildlife Management Institute. A great next step is to contact a local wildlife specialist, your state’s wildlife agency, the U.S. Fish and Wildlife Service’s Partners for Fish and Wildlife Program, the USDA Natural Resources Conservation Service, or a certified forester. For some projects, full or partial funding may be available.